On Thursday, Nov. 15, islanders marched along with of tens of thousands of people across the country, rallying in support of special counsel Robert Mueller. Fifteen days prior to the protests, President Donald Trump forced attorney general Jeff Sessions to resign. Sessions’ resignation led to the appointment of Session’s chief of staff, Matt Whitaker, as acting attorney general. Whitaker has been vocal in his opposition to the Russia investigation — a look into possible ties between Russia and the Trump administration. He previously supported the defunding of the investigation. As acting attorney general, Whitaker would have the power to manage some components of the investigation, and may potentially hinder the independence of Mueller’s investigation in Russian collusion. Whitaker’s power over the investigation is more significant than his predecessor’s. Sessions had no influence over the Mueller investigation, as he decided early on to recuse himself — Sessions worked on Trump’s campaign leading up to his election, and had private meetings with Russian diplomats. Critics of Trump believe that he is attempting to control the legal investigations surrounding himself by appointing an outspoken opponent of the investigation to the acting attorney general position. One of these signs acted as a center-point of Vashon’s march. A light-up banner reading ‘Nobody’s Above the Law’ was contributed by the Backbone Campaign, an organization that has supported many protests on Vashon and throughout the nation. “Backbone campaign has been nurturing this idea of solidarity brigades by supporting folks who utilize our [resources] for campaigns in their local communities,” Backbone Campaign Executive Director Bill Moyer said. Backbone also donated a device, called a GOBO, designed to use light to project a written message. The device is meant to “raise the visibility” of an issue. The campaign has sent these devices to 28 cities across the country in an effort to support local movements. “What we like about sending a spotlight out to a community … is that they can … adapt the message to fit whatever they are working on,” Moyer said. 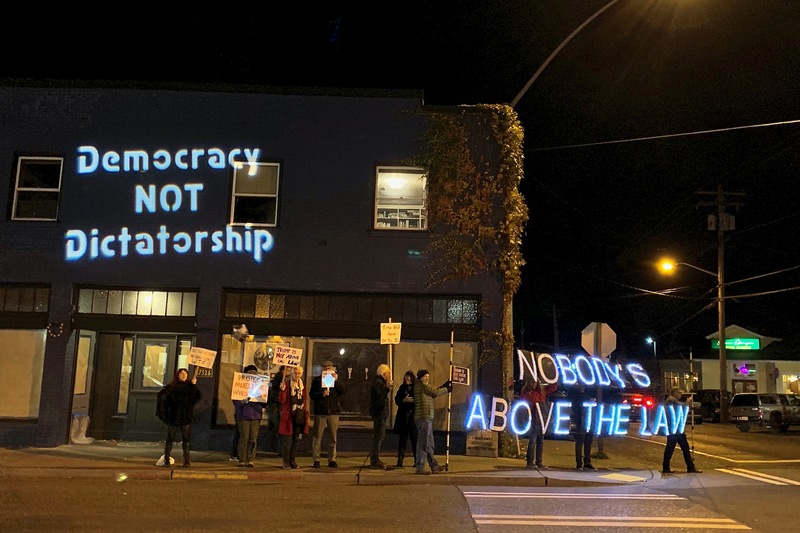 In the case of the Mueller protest on Vashon, the message projected was ‘Democracy Not Dictatorship.’ During the march, the projection was displayed on the Vashon Landing building — diagonal from the Hardware Store. Moyer explained the importance of working together when fighting for a cause, despite the political divides that exist within our country today: rallies give people the chance to come together and not feel so alone, especially as the march took place shortly after midterm election results came in. In addition to the national ramifications, last week’s protests held particular significance for Moyer.